Nosey is excited he is a launch mascot! It’s my great pleasure to announce version 3 of Splitwise for iPhone and web, which Marshall has memorably code-named “Fat Rabbit.” This is a major new relaunch, which changes our look and feel and adds popularly requested features like expense search, offline mode, bill editing, and push notifications. 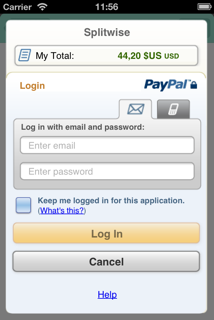 Perhaps most notably, we’ve entered the world of “mobile payments” with iPhone payments via PayPal. 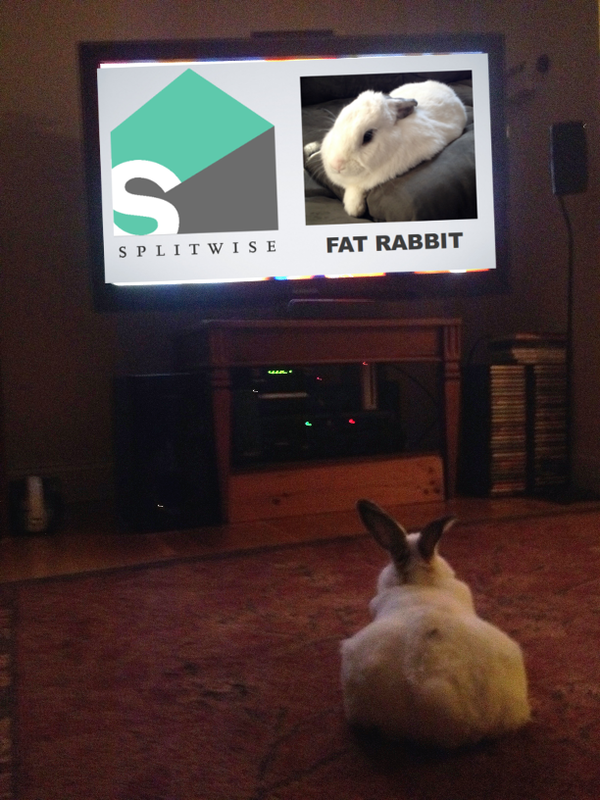 We have decided to relaunch Splitwise today, in spite of yesterday’s bombing of the Boston Marathon. We are deeply upset by the attack, and many dear friends of Splitwise were near the scene of the bombing or experienced a near miss. Our thoughts are out to anyone affected by the tragedy. In light of everything, we believe that the most ethical thing for Splitwise to do is to go ahead with business as usual. If you care to, join us for a tour of the new app. The first thing you’ll probably notice is the new color scheme and logo. On the website, you’ll see we’ve switched to a three-column layout that displays the balances on the side and cleans up the top bar substantially. We think this looks a lot cleaner, and it allows the top bar to stay attached to the interface comfortably while scrolling. You can also now scroll the list of friends and groups along with the rest of the page. The iPhone layout is extremely similar to this, except that the left-hand menu is compressed into the navigation tray that can be opened in the top left of the app. 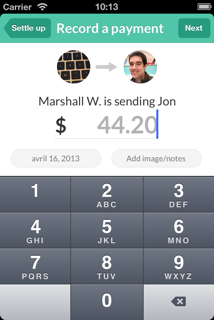 On iPhone, you can now pay friends back anywhere using the “Send money via PayPal” feature. You’ll be presented a choice immediately after hitting the Settle Up button. When we added “Pay via PayPal” to our website in September, we thought it sounded great (“I guess we do payments now too”) but weren’t sure anyone would actually use it. As it turns out, it has been a wonderful feature that we use at Splitwise ourselves quite frequently and users have been loving too. For now, PayPal payments are limited to $500/wk in $USD for US users only. 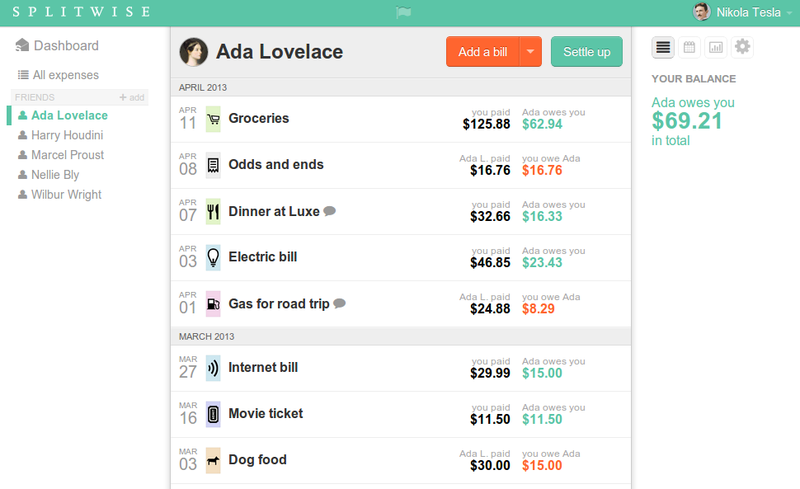 Of course, any user can make a payment via PayPal or Venmo or any other method and then record it in Splitwise. But the limits of the API permissions have kept us from going further than this for now. PayPal handles the payments – once you log in and do your business, it will take you right back to our app. If you are going backpacking, travelling in a foreign country, or just live in an area with spotty reception, the new offline mode on iPhone is a game-changer. Not only is data cached in the app (so that you can see everything that happens while you are offline), new bills can also be added, even with new friends, and everything will be synched to the server when you do get internet access. Bills that have not yet been synched will have a category icon that indicates that they are pending internet access. Even the balances update according to the unsyched expenses, unless there is a problem with the synchronization. There are some limitations: you can’t create groups or invite friends without internet access. Friends you add indirectly (by including their email address in a bill) will get invited, but will only appear on the home screen once the app gets internet access. If there are any problems, dialogue boxes will guide you into editing the bill and resubmitting once you have internet access again. We’ll have our people push notify your people. One frequently requested feature we are proud to start supporting is app push notifications for new expenses! 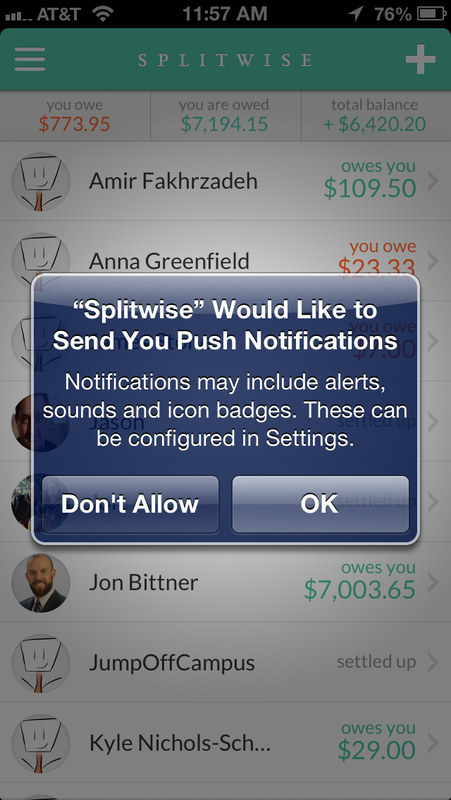 No longer do you have to rely on email for updates about what is going on in your Splitwise account. When you update to the new iPhone version, the app will prompt you and voilà! You can change push notification settings on the user settings page on either iPhone or the website. We realize it’s a little odd to tout this is a major new feature, but with all of the splitting possibilities available to our users, building that form has been somewhat of a challenge. We are happy to finally have it – woot! You can get to this menu by tapping the menu icon in the top left of the app. It seems all the cool social networking kids are doing left hand side-bar menus hidden behind a tap, and after seeing how much simpler it made some aspects of navigation, we’ve joined the party. 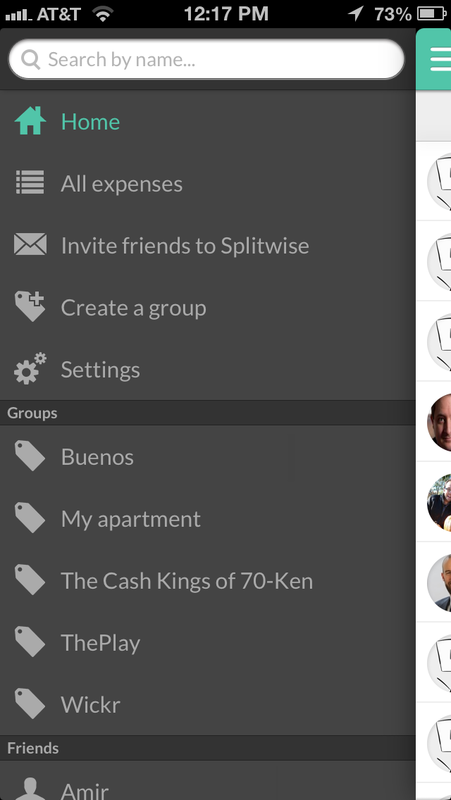 It’s especially useful for quick access to your groups and to get to the new “All Expenses” tab, which shows a list of all transactions. While I have the pleasure of writing this blog post, it was of course a huge team accomplishment. Vast portions of Fat Rabbit were written by Caleb Oller, and Fat Rabbit’s high level of polish is in part a testament to his skills. The update to the Splitwise logo and color scheme were designed by the ever-talented Nicole Mercer, a friend and fellow Betaspring alumni. Ryan, Marshall, and Caleb all worked together closely on both the website and mobile app, and it’s been by far our most collaborative release. As Splitwise’s token non-engineer, it’s been a pleasure to watch our engineering culture and process take shape as the team grows. Awesome! Nice work guys, looks excellent. I hope we can leverage push notifications soon for our apps! Me too Kamran! Glad you like it. Absolutely stunning upgrade! I must confess, I was on the fence on the SplitWise vs BillPin war, now I’m proud to being SplitWise-till-I-Die! Any chance of getting this interface on Android btw? Sorry for the slow reply. Yes, we are working on the Android version now… and by we, I mean Marshall is :). It’s his Next Big Thing. This is why having Caleb has been so huge for us – we can work on both platforms at once, since Marshall was our only mobile engineer for a while. I’m a huge Android fan myself – every phone I’ve had has been Android since the G1 (I then got a Nexus S, and now use a Droid Razr Maxx). I believe in the platform and love the openness, especially relative to Apple’s walled garden. Unfortunately, we’ve been doing iPhone first because it’s easier for our team to write great iPhone apps more quickly, and we can learn our UI lessons faster there. Especially with the vast proliferation of Android devices and versions, writing snappy and responsive Android apps has been a unique challenge. So yes, I hope we can delight our Android fans as soon as possible and it’s a big company priority! If you have any specific concerns, shoot us an email anytime at support@splitwise.com or feedback@splitwise.com. Any chance you are distributing a beta installer? If you email support@splitwise.com, we’d love to add you to our Android Beta list. We occasionally send out builds for major changes, usually a week or two before they go live.